While white water rafting is well known for the thrills and adrenaline rushes that it offers, it’s also a great opportunity to bond with friends, get an intense upper body workout and connect with nature. And contrary to popular belief, it’s not necessarily difficult. Practically anyone can have a good time white water rafting as long as they choose a stretch that matches their skill level and come equipped with all the right information. Read our tips below to prepare for your first white water experience. As white water rafting is an out-of-the-ordinary experience and space on the boat is limited, you may be wondering what you can bring. Swimsuit: You’ll be spending the entire day on river rapids, so you’re likely going to get wet. For this reason, it makes sense to bring swimwear that will be comfortable for many hours. For guys, this could be board shorts as well as a rash guard to keep from getting burned. Women may want to wear swim/river shorts and a rash guard, which makes going to the bathroom in the wildness a bit less complicated. Headlamp: This is an indispensable item for finding your way around campgrounds in the dark and it frees up your hands for putting tents together, cooking meals and playing board games. Try to find a headlamp with rechargeable or long-lasting batteries. Rain gear: While rain may not be a big deal when you’re on the river and completely soaked anyway, once you’ve set up camp, you’ll probably want to be dry. Bringing along a waterproof, lightweight jacket is a good idea in case it starts to pour when it’s most inconvenient. Wet wipes: Camping on a rafting trip typically means you’ll be going days without showering. While you’ll have many opportunities to cleanse yourself in the river, wet wipes will allow you to feel fresher after a long day of rafting right before you slip into your camping clothes. These wipes will help to remove any sunscreen buildup or accumulated sweat. Try to find ones that are biodegradable and environmentally friendly. Long underwear: Wearing long underwear or a thermal is a smart way to provide an extra level of warmth, as they are lightweight and insulate well. They work best when worn between upper layers when you’re at your camp, but you can also wear them at night in your sleeping bag, where they can serve as pajamas. On hot, sunny days, they can also provide an extra level of protection from the sun. High-quality sandals: We strongly advise against flip flops — you can easily lose them on the river, and they don’t provide enough support for walking on the rocky shores. Keep in mind that rafting involves more than being on the river — you’ll also be walking along the river bank and getting on and off the boat. For this reason, it is critical that you wear a sturdy pair of sandals with strong straps and supportive backs that are snug but comfortable. Hand sanitizer: If you feel uncomfortable about washing off with river water, you may want to bring along hand sanitizer, which will help eliminate germs, viruses and bacteria. Look for one with at least 60 percent alcohol. Water bottle: As you will be exerting yourself throughout the day, it is critical that you hydrate — which is easy to forget when you’re surrounded by water. Bring along a water bottle equipped with a carabiner, which will allow you to connect it to the outer rim of the raft or your pack. Sunscreen: Sunscreen is an absolute necessity on white water rating trips. Buy sunscreen that’s rated to at least SPF 50 and is sufficiently waterproof to endure a whitewater rafting trip. Hats: As with any activity where you’re out in the sun all day, you should wear a hat that will protect your face from the sun’s damaging rays. The hat should have a chin strap so you won’t lose it if the raft flips. You may also want to bring along a beanie for when it gets cooler at night. Polarized sunglasses: Polarized sunglasses come with specialized filters that prevent strong reflected light from passing through, which will both reduce the glare and improve your visibility. Don’t forget to bring along a retaining strap. Socks: Bring some socks to wear in the evening at the camp or while sleeping. It feels great to have dry toes after being wet all day. Plastic bags: You’ll need these to store your belongings and keep them dry and safe on the raft. It’s also a good idea to bring along several trash bags for keeping dirty or wet clothes. 2. What River Should I Chose? Class I: Perfect for absolute beginners, these rapids feature small waves and few obstructions. Class II: Also good for novices, Class II rapids feature clear, wide channels and require only occasional maneuvering. Experienced paddlers easily avoid rocks and other obstructions. Class III: These rapids feature irregular, medium-sized waves that are sometimes hard to avoid. Rafters must perform complicated maneuvers and have good control of the raft through narrow passages. They may also encounter strong eddies, especially on rivers with large volumes. It is recommended that inexperienced rafters who tackle Class III rapids scout beforehand. Class IV: Class IV rapids are powerful and intense but are still generally predictable. Rafters must be able to handle the raft precisely when passing through turbulent waters. Some rapids of this class have large holes and waves that are unavoidable. There are also narrow passages that require quick movements under pressure. Class V: This class is for experts only and features long, violent and obstructed rapids. Rafters may also encounter huge holes and waves that cannot be avoided as well as steep chutes. Because these rapids can be exceptionally long, rafters who attempt Class V rapids must be in good shape. Swimming in these rapids is dangerous. Follow these tips to make your rafting trip safer and more enjoyable. Spots on rafting trips tend to fill up fast, so if you want to get a tour with your preferred length and difficulty, it’s best to book as early as possible. Before booking, speak with other members of your group and find out what they can handle at what kind of trip they would prefer. When looking for a good outfitter, ask lots of questions. Find out how long they’ve been around under their current ownership. You should also ask about the training that their guides have received and which government entity is in charge of their training. These answers will tell you whether the outfitter is professional or not. By picking a professional outfitter, you can be certain that they adhere to professional safety regulations. While a personal flotation device won’t necessarily save your life, it greatly increases your chances of survival. Just make sure that you wear it correctly, which means that you must clip all the buckles. The jacket should also be snug enough that you can’t pull it up over your head but not so snug that you can’t breathe. To ensure it fits perfectly, asks your guide to fit your jacket. Regardless of the difficulty level of your rafting course, wear a helmet at all times. Holding your paddle incorrectly is unsafe. To grip it properly, one of your hands should grab the shaft at the paddle’s base, and the other should always be over the “T” grip, which can cause serious injury if it hits you in the face. By keeping one hand on it at all times, you can maintain control of the paddle and cushion the blow if it does come flying toward your face. Ask your guide about the correct technique. Whether you’re taking a swim in the river, fall overboard or just jump in for fun, remember the two techniques for swimming. One is called the “Down River Swimmers Position,” where you float on your back and keep your head up so you’ll know where you’re going. Your feet should be pointed downstream and your knees should be bent slightly. By doing this, if you are heading toward a rock, your legs and feet can absorb the shock and push you off. Put your arms out to the sides to help maintain control and don’t let your bottom sink too low, as it will be more likely to hit submerged rocks. The other position, which is more common in rescue situations, involves you floating on your stomach and pointing your head in the direction you want to go. Speak with your guide about when it’s best to use each position. If you want to swim to the shore of the river, swim all the way there. You should never stand in a river with a current. Even guides do not usually walk in water that comes above their shins. Not walking in a river with a current also prevents “foot entrapment,” a scary situation where your foot gets stuck in a crack on the river’s bottom. Before setting off on your rafting adventure, your guide will give a safety talk that explains how to deal with any situation you may encounter on your rafting trip. Make sure to give extra attention when they speak about high-siding. This refers to a command your guide may shout to keep your raft from flipping over. While this may seem scary, it is important not to panic. The chances of this happening are rather slim, but on the off chance that it does happen, you’ll be glad you listened to your guide’s safety talk. High-siding is actually rather straightforward. If your raft collides with a rock, it is typically in a sideways position, which will then cause water pressure to build up on the side of your boat facing upstream. To keep your boat from capsizing, your guide will then shout “high-side,” meaning that you should go to the side of the boat facing downstream and throw all your weight in that direction, which is the direction the river is flowing. As mentioned earlier, rafting adventures are great opportunities to enjoy the company of friends and the beauty of nature. Instead of listening to your music, listen to the water, the wind and the sounds of the forest. Okay, so here’s one exception to the “don’t bring too many electronics” advice. Between the excitement on the river and the campground activities at night, you’ll be participating in a variety of fun activities, some of which you’ll probably want to capture with a camera. Make sure to take along some spare batteries and memory cards. Whether you’re an absolute beginner or have been rafting for years, this challenging sport can be a little scary. If you find yourself in a more stressful situation that you had anticipated, just remember that you are being accompanied by trained and experienced professionals who can read the river well. The depth of the river can vary. Calmer rivers with slow rapids tend to be deeper and faster rivers with irregular rapids tend to be shallower, usually under five feet deep. While falling off the raft is not common, if you do end up in the river, use one of the swimming techniques explained above. Every person in the raft will have to paddle. Make sure to use strong paddle strokes take into account the position of all the other paddlers. Keep in mind that nothing can fully prepare you for a rafting trip, and you must expect the unexpected at all times. 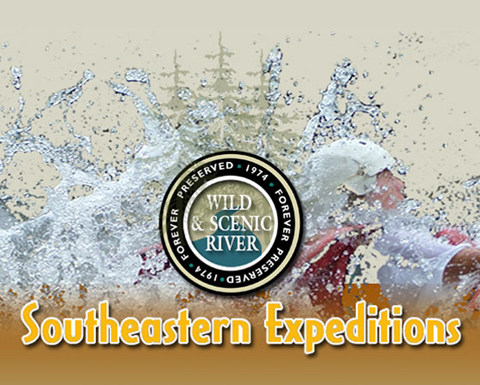 Southeastern Expeditions offers rafting adventures on the famous Chattooga River and is located just a two-hour drive from Atlanta. You can choose from several rafting experiences, including a Section III trip, which is perfect for beginners, groups and families, and a Section IV trip, which features the most intense rapids in the East. You also have the option to go on an overnight trip, which covers both sections of the river. Feel free to call us anytime at 1-800-868-7238 or contact us online using our form.